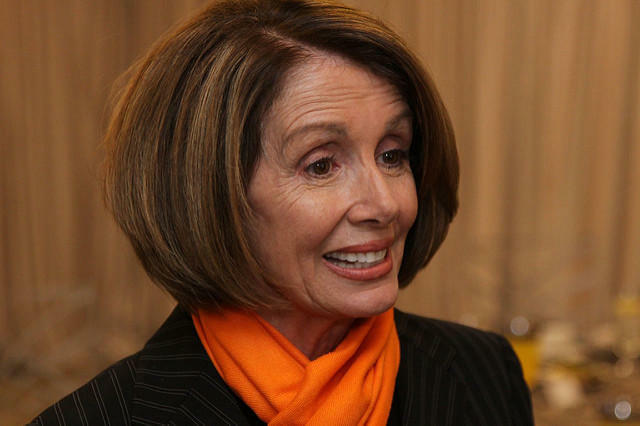 House Minority Leader Nancy Pelosi (D-CA). Gov. Andrew Cuomo vowed Tuesday to help defeat the state’s Republican members of the House of Representatives when they are up for election next year. House Democratic Minority Leader Nancy Pelosi introduced Cuomo at a rally of union workers at the Jacob K. Javits Center in New York City, where he made his remarks. While Cuomo said he’s working to defeat all of the state’s GOP congressional representatives, he directed his ire at western New York Rep. Chris Collins and the Hudson Valley’s Rep. John Faso. The two angered Cuomo earlier this year when they successfully included in the House repeal of the Affordable Care Act a plan to force the state to take over billions of dollars in county Medicaid costs. Cuomo never mentioned President Donald Trump by name. A spokesman for Collins called Cuomo’s attempt to defeat the congressman “laughable” and said that Cuomo received only 34 percent of the vote in the district during the governor’s last re-election campaign. Cuomo’s actions also drew notice and a critique from the Republican National Committee, which connected the governor to a former top aide, Joe Percoco, who is facing trial on bribery and other charges. They referenced Percoco’s use of code words from The Sopranos television series including saying “boxes of ziti” for “money” while Percoco allegedly carried out pay-to-play schemes. The governor has not been accused of any wrongdoing. State GOP Chair Ed Cox accused Cuomo of having “delusions of grandeur” and putting his national interests ahead of the state. Groups on the left also are critical of Cuomo, saying the governor has more work to do closer to home. Bill Lipton, the state’s Working Families Party director, said while it’s “great” that Cuomo wants to help take the House back for Democrats, he should be working just as hard to reunite Democrats in the New York state Senate. The state Senate is currently ruled by Republicans, with the help of several breakaway Democrats. Democrats have 32 seats, numerically enough to rule the chamber, but are divided into different feuding factions. There are the mainstream Democrats, the breakaway Independent Democratic Conference and one lone Democratic senator who conferences with the Republicans. Lipton said when the governor was seeking re-election in 2014, he pledged to help elect more Democrats to the state Senate in exchange for the Working Families Party endorsement. Lipton said that promise was never fulfilled. Cuomo did raise money and endorse some Democratic candidates for the state Senate in 2016. Democrats already control the state Assembly, and, of course, the governor’s office. Lipton said if Democrats also ruled the state Senate, New York would be in a stronger position, like that of the state of California, to provide a counter-vision to Trump and the Republican-led Congress. Cuomo spokesman Rich Azzopardi said even with the state’s current political divisions, New York still has some policies that are more progressive than California’s, including paid family leave.